Living in an ever-changing environment where change is inevitable, it is interesting to observe how we react or respond to change. Just as how everything is moving up the value chain in our globalised economy, likewise we as humans also have a value chain to climb. Climbing up this chain enhances our development (in particularly spiritually) as a person and being able to be a value-add to society. But I think it is safe to say that as humans, it is our nature to get easily caught in habits, routines and traditions. Cos due to our need to be secure, we some times or most times rely on these “patterns” in defining who we are. Even when these “patterns” may be hazardous or unhealthy, we may still keep them as they can be very difficult to unlearn once ingrained in our lives. The difficulty may arise from the efforts needed to be invested in re-learning. CHANGE though good, may not necessary come about so easily. And so it seems that we people some times want a change, but don’t want to change. Besides it being troublesome, resistance (I believe) is mainly an attitude issue. 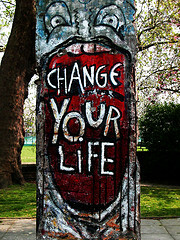 This is where we become too comfortable or used to to our current position that we do not desire to and change at all. This could be a fear factor or a case of being arrogant/ignorant. In managing change effectively, what is most vital is having a right attitude with a positive outlook. This would provide the flexibility factor in the face of change. And of cos, the key is being able to see circumstances in the light of God’s purpose. With change emerging some times without warning, flexibility provides us the reflexes to respond appropriately with the new situation.Understanding that change is the only constant, we should also always be prepared. By being aware and keeping in touch with our environment and its going-on’s, we do ourselves a big favour in studying the tide and wind direction as how a sailor would at sail. Throw away any status quo kind of an attitude, or else when change happens we will be “caught with our pants down” and the consequences would only be ours to solely bear.